Our Vision is a community where safety and well-being are paramount. The Mission of Allen County Juvenile Probation is to rehabilitate juvenile offenders by providing supervision, community-based programming and educational services to empower and enrich the lives of juveniles and their families. Intake Probation is responsible for addressing and seeing a case through the Court process. An Intake Officer will be assigned to the juvenile’s case, and is responsible for gathering the facts and recommending whether a case should be: dismissed, informally adjusted, referred to counseling or another agency, or if a delinquency petition should be filed. Intake Officers work closely with the juvenile, parents, school officials, service providers, and the Court to assist in implementing a treatment plan for the care and rehabilitation of the juvenile. Administrative Probation is the lowest level of probation offered by the Court. Administrative Probation is generally ordered as part of an Informal Adjustment, however, it can be ordered after adjudication as well. Administrative Probation is geared to handle the low risk offender. As a general rule, once a child has been placed on Administrative Probation, the term is approximately six (6) months but can be extended when necessary. Field Probation is responsible for monitoring juveniles who are placed on probation by the Juvenile Court. This division is divided into three (3) regional probation offices thus allowing an opportunity to provide services and supervision to juveniles and their families relatively near their homes. Field supervision consists of maintaining contact with the juvenile, the family, school personnel, mental health professionals, law enforcement officers, social service providers, and other agencies that may positively impact the juvenile and his or her family. Conditions of probation may include but are not limited to: school attendance, employment, curfew, counseling, and refraining from all illegal substance usage. The South Regional Probation Office has, through generous community donations, developed a lending library. There are books available for all ages and reading levels, ranging from books that can be read to infants and toddlers, up to post high school graduation reading material. The books are available to all probationers and their families, not just those who reside in the South Probation District. The library is situated on the second floor of the South Regional Probation Office and may be visited any time during regular probation office hours. The DAP Program was implemented by the Court in 1991 as a tool to reduce the number of juveniles being held in detention. DAP provides the opportunity for a juvenile to remain in the home, and within the community, during the court process rather than being held in detention. Simply put, DAP is a conditional release while a juvenile is pending a court hearing. The goal of DAP is to provide additional structure and supervision within the home to juveniles who are pending court proceedings. There are three levels of DAP supervision – curfew checks (least restrictive), home detention (moderately restrictive), and anklet supervision (most restrictive and requires a phone line). The level of DAP supervision that a juvenile receives is determined by the Court. The Court will consider the nature of the offense and/or a juvenile’s legal history in deciding the DAP supervision level. Each DAP level has a specific set of rules that are designed to provide the juvenile with structure and supervision while allowing the juvenile to remain in the home and continue with his or her daily schedules such as school, work, or counseling. If a juvenile is not compliant with DAP rules, the juvenile may be returned to detention. A detention review hearing will be scheduled for the next business day after a juvenile is taken into custody. The Electronic Monitoring Program is the most intensive, restrictive, and structured form of probation supervision that the Court has to offer. EMP requires a juvenile to be monitored by an anklet device for the duration of his or her probation supervision, which is a minimum of 6 months. While on EMP, a juvenile’s schedule and daily activities are closely monitored. EMP tends to be utilized when all other community-based services have been exhausted or when the juvenile is adjudicated delinquent for a serious offense. The goal of EMP is to provide a juvenile the opportunity to complete probation while in the home and within the community. As well as providing strict structure and constant supervision, EMP helps a juvenile develop skills such as responsibility and time-management. The Placement Team is composed of three specially trained probation officers. These officers are responsible for securing a placement for any child who has been ordered by the Court to be placed outside of their home into placement facilities with programs that fit the child’s counseling or treatment needs. Placements range from foster care to residential treatment facilities, each serving a specific purpose. Once a placement is secured, the Placement Officers are responsible for monitoring the child’s treatment program by conducting placement visits and maintaining regular contact with the treatment team. Placement Review Hearings are held every six months, at which time the child’s progress in placement is evaluated. For more information on the Allen County Learning Academy, please click here. There are several different types of fees that can be assessed through Juvenile Probation, which are listed below. The amount of fees is set by both state law and county ordinance. Different fees are assessed depending on the level of probation supervision and/or services ordered by the Court. Once a fee is assessed, a specific time frame is ordered for payment. If a parent, guardian or custodian is unable to pay all of the fees at one time, payment arrangements should be made at the court hearing. Pay with cash, check, credit card (which includes a convenience charge) or money order in person at the Allen County Juvenile Center. Hours are Monday through Friday at 8:00 am through 4:30 pm. Make your check or money order payable to: Allen County Juvenile Center or ACJC. Pay by telephone by calling 888-064-7888. A convenience charge will be added for this service. 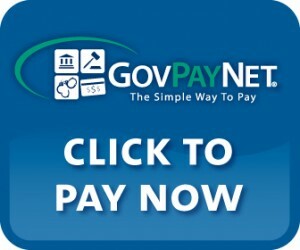 Pay by using a Visa, Master Card, American Express or Discover Card by visiting: www.GovPayNow and entering location code #8759. A convenience charge will be added for this service. Present your cash, check or money order payment in person to the Clerk of the Allen Superior Court, Room 111, Allen County Juvenile Center. Hours are Monday through Friday from 8:00 am through 4:30 pm. Make your check or money order payable to: Clerk of the Allen Superior Court. Mail your check or money order (no cash) to the Clerk of the Allen Superior Court, Room 111, Allen County Juvenile Center, 2929 Wells Street, Fort Wayne, IN 46808. Pay by personal check or money order payable to the Indiana Department of Child Services. Mail to: Indiana Department of Child Services, Cash Management Unit, 402 West Washington Street, Room W 364, MS-54, Indianapolis, IN 46204. To ensure proper credit please include a note with the full name of the juvenile with the file number and/or cause number. The Court may order the juvenile to complete a certain number of hours of community service work as part of the juvenile’s probation supervision. A juvenile’s probation officer may also require a juvenile to perform community service work in order to impose consequences for a probation violation without returning to court. Rules and locations of potential worksites for community service are set forth below. It is the juvenile’s responsibility to contact a potential worksite and arrange the dates and times to work. It is not mandatory to choose a site from the list below; however, any chosen worksite must be a non-profit agency or religious institution and the work must be performed without pay. A juvenile may choose to work at more than one location if necessary. If a juvenile chooses to pursue this option, the juvenile is required to complete the hours as arranged. The juvenile is responsible for being prepared for the hours and type of work arranged. Juveniles must dress appropriately for the type of work performed. If a juvenile is scheduled to work several hours at one time, it is the juvenile’s responsibility to provide his or her own lunch and beverages. The juvenile is responsible for providing and/or arranging transportation to and from the worksite. Once community service is completed it is the juvenile’s responsibility to return the Community Service Referral Form to the probation office in person, by mail, by e-mail, or by fax. The form MUST be submitted in writing to the probation office to earn credit for any work completed. Questions regarding community service work should be directed to Officer Caprice Ramirez at (260) 449-8072. THE FOLLOWING RULES MUST BE FOLLOWED IN ORDER TO PARTICIPATE IN THE COMMUNITY SERVICE PROGRAM ADMINISTERED BY THE ALLEN SUPERIOR COURT JUVENILE PROBATION DEPARTMENT. VIOLATIONS OF ANY RULE COULD RESULT IN YOU BEING REQUIRED TO APPEAR FOR FURTHER HEARINGS. Contact the agency to establish a work schedule immediately after the Hearing. Your work schedule and hours are established by the agency and what is convenient for them – You do not dictate your hours. Clothing: Proper clothing is mandatory. Ask the agency before you report as to their dress code. You are Required to Bring your Own Lunch if Working an Entire Day. Good behavior: Your supervisor has the right to dictate your behavior while completing your duties. This includes restrictions on behavior. ANY UNACCEPTABLE BEHAVIOR WILL RESULT IN FURTHER CONSEQUENCES AND POSSIBLE DETENTION. Your child must have contact information available in the event of an emergency or termination. Should it be suspected that you or your child is under the influence of an illegal substance the Police Department will be contacted immediately and you or your child could be taken into custody. No tobacco products allowed. PLEASE NOTE THE LISTED WORKSITES ARE RECOMMENDATIONS ONLY AND ARE NOT MANDATORY. IF YOU WISH TO WORK AT A CHURCH OR PUBLIC SERVICE AGENCY NOT LISTED YOU MAY DO SO AFTER CONTACTING PROBATION. For an expungement request to be considered by the Court, the individual must be at least eighteen (18) years of age, AND one (1) year must have elapsed since release from Court’s jurisdiction. For example, if the individual was 18 ½ years old when released from probation, he or she should apply one year later, when 19 ½ years old. In addition, no charges may be pending against the individual in the adult criminal justice system. The process may take up to six (6) months, so please do not expect an immediate response.